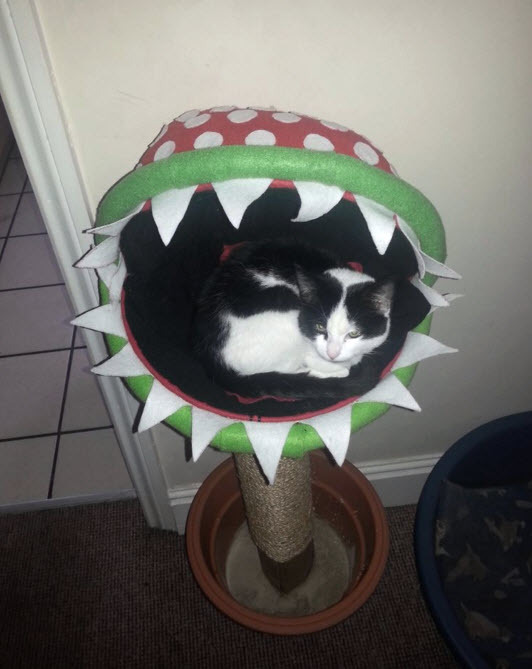 Build a Piranha plant for your cat to sleep in! Get two wire hanging baskets and use zip ties to connect them in the position of the Piranha mouth. Get a tall wood block to be the plant stem, put a small piece of wood inside the base of the Piranha mouth and drill the wood block onto the top of the post. Get two round cushions and attach them inside each basket. Cover the Piranha head with felt in the style of the Pirhana plant. Drill the base of the plant post to a tall plastic planter and wrap the plant post with sisal rope, gluing the rope in place as you wrap it around the post. Fill the planter with cement to add stability at the base.